Philip Larkin may never have worn a uniform or seen combat (other than the domestic sort). But he offered what must be the pithiest, most accurate description that’s yet been written of military service. “Life is first boredom, then fear,’’ says the narrator of Larkin’s poem “Dockery and Son.’’ The relevance of fear to being a soldier or sailor, airman or Marine is obvious. The relevance of boredom is less so - until you recall that most expressive of military commands, “Hurry up and wait.’’ The things that happen in war are terrible. The things that don’t happen can be terrible in a different way. Both the fear and boredom of life in uniform are on display in “Grunts: The GI Experience,’’ which runs at Panopticon Gallery through Jan. 10. Is the show’s title a hint of things to come? “Grunts’’ didn’t come into common use as a term for foot soldiers until the Vietnam War. Yet all the photographs here are from the Korean War era and World War II. Might there be a subsequent show on the Indochina conflict? If it’s as good as this one, it will be worth waiting for. 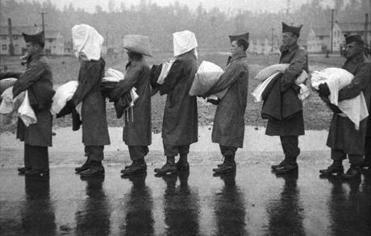 Slightly less than half of the photographs are from the Korean War era, 22 of them, all taken by Harold Feinstein. The World War II images consist of 22 by the Acme Photo press agency; three by Robert Capa; three taken by unidentified US military photographers; one by Wayne Miller, who served as a lieutenant with Edward Steichen’s Naval Aviation Photography Unit; and two family snapshots from the collection of Panopticon owner Jason Landry. The inclusion of that final pair is indicative of the sense of the personal, even tender, found again and again in these pictures. What makes so many of Feinstein’s photographs so interesting to look at is how vividly they capture the tedium his sitters were experiencing. Titles are self-explanatory: “Cigarette Break,’’ “View From the Porthole,’’ “Reading Blondie Comics,’’ “Four GIs Asleep on a Bench,’’ “Sleeping in Mud.’’ How could Feinstein not have had such an appreciation for the oppressive emptiness of so much of military life? He was himself a soldier, though not an official photographer, at the time he took these pictures. The contrast with the Acme and Capa photos, most of which were taken either during combat or in its vicinity, could hardly be greater - and that extends to the titles. Some are jokey (“To the Victors Belong the Goils,’’ a shot taken in liberated France). Some are jingoistic (“Get the Carriers . . . and They Got Them!’’). Even when in the middle of action, the pictures still stand somehow outside the GI experience. They’re more for the folks back home than they are about the fighting men in the frame. With Feinstein, the situation is the exact opposite. That basic dynamic is true even of Capa’s pictures - Capa, who famously said, “If your pictures aren’t good enough, you’re not close enough.’’ It took bravery to be in a position to take as beautifully composed an image as Capa’s “Fighting French on the March, Sicily’’ (another eye-roller of a title). But it was an artist who took it, not a soldier. Maybe it’s Miller’s joint status as officer and photographer that makes his photograph of a sailor on lookout duty carry such emotional weight. 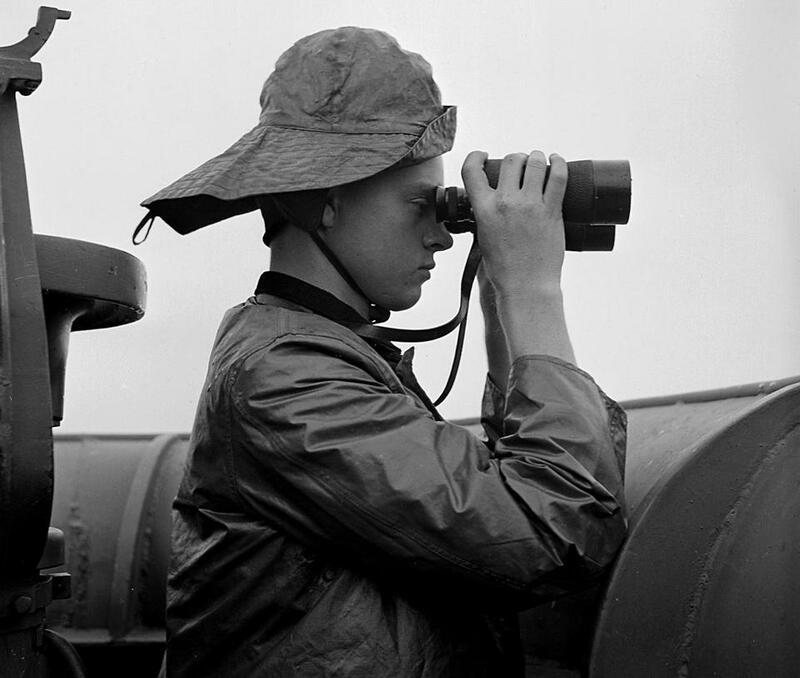 The camera’s so close to the young man - he’s a boy, really - as he looks through those binoculars. Yet not so close: The look on his face suggests he could be a million miles away. “Two Perspectives: Bradford Washburn and Vittorio Sella’’ includes 34 photographs (15 Washburns, 19 Sellas) from the two premier photographers in the history of mountaineering. As one might expect when high in the sky with such guys, the images are spectacular, beautiful, and often vertiginous. Yet the ones that stand out are the anomalies. The subject of Sella’s “Woman in Festive Dress at Cheghem Village’’ could be Falconetti’s understudy - talk about a daunting task! - for “The Passion of Joan of Arc.’’ What a face she has. As for Washburn’s “Alaskan Prospector With Pet Raven, Glacier Bay, Alaska,’’ it must have been harder to train that bird than to climb any number of mountains. At: Panopticon Gallery, 502c Commonwealth Ave.